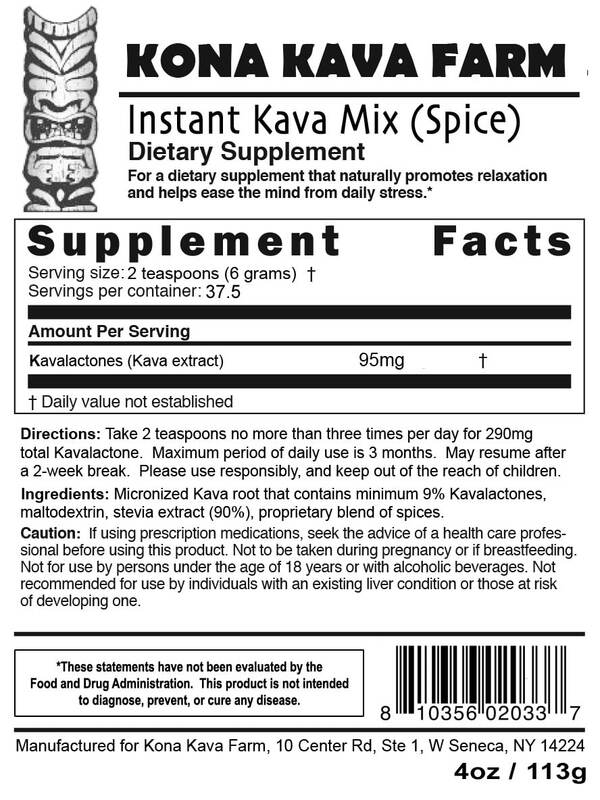 Kona Kava Flavored Instant Kava Mix provides the stress fighting benefits of powdered kava root in 3 delicious flavors. Available in banana/vanilla, cocoa, and spice. We have 4 ounce and and 8 ounce sizes so there is something here for every taste and preference. 4 oz $13.99 4 oz 13.99 Kava Points. 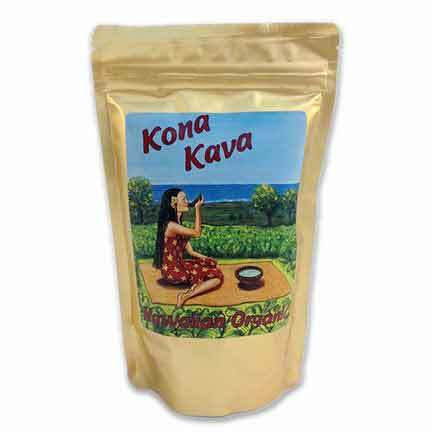 8 oz $24.99 8 oz 24.99 Kava Points. Choose your favorite Instant Kava Drink Mix flavor in 4 or 8 ounces from the options menu above. Directions: 2 teaspoons (6 grams) no more that three times per day (total of daily dosage not to exceed more then 6 teaspoons). Maximum period of daily use: 3 months. Use may resume for 3 months after a 2-week break. *These statements have not been evaluated by the Food and Drug Administration. This Instant Kava Drink Mix is not intended to cure, treat, diagnose or prevent any disease. I tried Mona kava for the first time and did not feel the effects first I took 2 teaspoons then a little over an hour took a double dose and still nothing. I had a empty but I heard about a reverse tolerance? Does it take a few times for your body to get used to digesting? I’ve been using kava-6 for about a week as well and haven’t felt much. If this is your first time using kava, then I would suggest giving it another try. Some people require a few experiences with kava before it will begin to produce predictable, consistent effects. Reverse tolerance (An increased sensitivity to the effects of kava, with frequent use) is often reported among kava users, although the degree to which this phenomenon is experienced varies from person to person. My best advice would be to use kava a few more times, and be aware of how much you are taking. Some people require a bit more than the recommended dose. Yet another amazing product! This instant kava not only has a good taste, but has amazing calming benefits as well. I am constantly amazed with how well it works! I love that I can just mix it up in a glass of almond milk and it’s ready to go. Great product for a great price. I really like the Instant Kava that I received from Kava.com. It is easy to mix nd it taste pretty good. I can attest to the relaxing properties of this drink. I feel it almost immediately after drinking my Kava Cocoa drink. I highly recommend this product to anyone looking for quality Kava and the staff are very friendly and accommodating. I stopped by my local cafe to unwind from a long, difficult week at work and hear some music. They started serving Kona Kava. I was interested in trying it, especially as it can help back pain. I enjoyed the cup of Banana-Vanilla Kava slowly, experiencing the numbness on my lips. I felt my anxiety ebb away, and the edge to the tense muscles. I also have a fibroid compounding the pain in my low back. I was surprised to experience how the kava seemed to open up the contraction in the area. I went home and had a restful sleep too. I’m very happy I tried it and I’ve ordered more! I have been Battling terrible mood swings , anger issues, and depression for quite some time now…I decided that I need to get help. I wanted to start with the natural approach first before going to the Dr. and asking for meds, I didn’t want to go the med route so I decided to do research on kava , tried it out and started with this instant mix Cocoa flavor. So glad to hear your personal story about your experience with Kava. You certainly did make a great choice for your introduction to Kava, and it’s amazing to hear about someone else who’s life has been changed for the better by Kava. The fact that you “feel at peace” when you drink Kava is the very heart of the Kava experience! It’s not called the “Plant of Peace” for no reason!